Eero Saarinen was incredibly influential in shaping the American postwar design movement. Born in Finland to Loja, a weaver and photographer, and architect Eliel Saarinen, one of the founders of the Cranbrook Academy of Art, Eero was primed from the start to take a place among the designers and architects developing and strengthening an environment primed to change the domestic and industrial face of the nation. Saarinen moved with his parents to the United States in 1923, went to study in Paris in 1929 and returned to enroll in the architecture program at Yale from 1930-34. After graduating, he worked briefly as a furniture designer with Norman Bel Geddes, but left in 1937 to join his father’s architecture practice in Ann Arbor, renamed Saarinen and Saarinen upon his inclusion. During this period, in which he was also teaching design at Cranbrook, he was introduced to Charles Eames and they collaborated on a series of furniture that would dominate the 1940 “Organic Design in Home Furnishings” show at the MoMA. Their curved “Conversation” chair in several variations, sofa unit, wooden shelving and desk furniture employed a number of popular innovations. They made structural shells for their chairs with layers of glue and wood veneer, and put their cabinets on bases, introducing a new flexibility of placement and function. Saarinen went on to collaborate with Eames on his experiments with molded plywood in the early 1940s. For the US navy they created splints that aimed to recreate the human form and looked like modern sculptures. They applied these same processes to plywood furniture, but Saarinen began designing forKnoll and Eames for Herman Miller, so their collaborative work dissolved over the years. In the late forties Saarinen designed a number of curvy, sculptural chairs for Knoll. Of the pieces that became well-known, the 1946 “Grasshopper” chair was made in bent plywood with an upholstered seat and the 1948 “Womb” chair revisited the shape of the “Conversation” chair, updating and improving the cozy design and adding an ottoman and sofa to the series. The organic “Womb” chair was made so that you could curl up in several different ways and, in effect, be enveloped in the chair. In 1947 Saarinen won a competition to design the Jefferson National Expansion Memorial in St. Louis and his enormous, simple arch design became the popular “Gateway to the West.” Other architectural projects over this period included the General Motors Technical Center in Michigan, for which he also designed a number of office chairs produced by Knoll, the sloping and futuristic looking TWA Terminal at JFK Airport in New York made to look like a bird in flight, and the Dulles International Airport in Washington D.C. 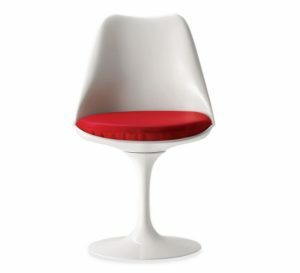 In the 1950s Saarinen designed a series of pedestal furniture for Knoll, hoping to create a clean visual style that eradicated what he called the “slum of legs” that he thought sullied many chairs. The pieces, which included the “Tulip” chair and side table, were actually made from both fiberglass and aluminum, but he painted the entire base white in order to make it look as though it had been made from a single material. Saarinen died very young; leaving behind children from two marriages and a blossoming career that embraced a new breed of modernism in which there are very few straight lines.